« How do I ignore negative values on a Honeywell paperless recorder? Ran into a situation last week that taught me an important lesson. A customer took a tank out of service for major repairs, so they moved the Siemens radar level transmitter to a different tank. Even though the radar unit performed flawlessly on the first tank, they ran into difficulty getting the correct level readout in its new installation. The mechanical guy had moved and remounted the transmitter. The I&E tech had wired it correctly, and then did a master reset before starting a fresh configuration. After going through the configuration, he couldn’t get a valid level readings in the upper fourth of the tank level. The second tank was near its full level and the technician (properly) wanted to wait to do an Auto-Learn scan until the tank level approached empty. In the meantime, we were all scratching our heads trying to figure out why the upper level readings were not correct. In frustration, I finally resorted to pulling out a manual . . .
Siemens radar level transmitters use a function called “False Echo Suppression” in the “Auto Learn” mode to differentiate a false echo from a true echo. 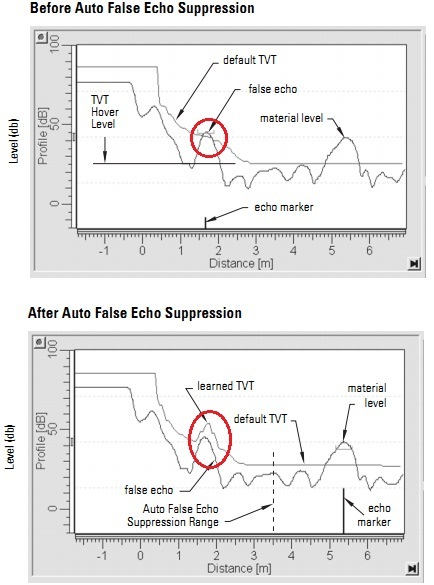 False Echo Suppression makes adjustments to the baseline or threshold curve, known as the TVT, to eliminate false echoes caused by permanent obstructions (ladder rungs, side wall seams, braces or cables) that fall within radar transducer’s signal beam. The charts at the right show a before and after TVT baseline curve. “Learned TVT” is valuable on a daily basis if you’re working with tanks and silos that have internal obstructions. But, it can cause problems if you decide to move a radar gauge. In our case, the second tank did not have the same internal obstructions as the first tank. The radar unit was holding onto the first tank’s learned TVT curve, and it interfered with a valid level echo range in the second tank. The manual revealed that the TVT Setup’s False Echo Suppression is NOT reset to a factory default condition when the ‘master reset’ function is applied. To reset the False Echo Suppression parameter back to factory default, you need to take one more step: Turn off auto false echo suppression action in the TVT setup, forcing the signal processing to use the default TVT. When the technician turned off the False Echo Suppression, the radar gauge produced correct high level readings on the second tank. The exclusion of the learned TVT curve with its false echo suppression from a master reset action applies to all Siemens radars: the LR200, LR250, LR260, LR400, LR460 and LR560; the one exception is the LR300. This step isn’t necessary for Siemens’ ultrasonic level transmitters. They all use the P999 master reset parameter that resets all parameters including False Echo Suppression. This entry was posted on November 28, 2011, 1:13 pm and is filed under Configuration, Level, Siemens. You can follow any responses to this entry through RSS 2.0. You can leave a response, or trackback from your own site.